With the return of everyone’s favorite vigilante/law-enforcer Jack Bauer, and the show’s move from Los Angeles to here in DC, I thought it might be a good time to track 24′s progress through our streets and see how we fare. This’ll be a live-blog tonight, and if it works well, we’ll bring it back next week. Cellphone in the driver’s compartment? That’s a ticketing. Good thing he got plowed by a nearby truck.Skyscrapers downtown? Oh come now. That’s not DC. Looks like Los Angeles, to me, despite the “Capitol” in the background in the first scene. At the Capitol. Hey, that’s the Capitol, alright. Jack’s testifying on the Hill. Mike says it looks like the House Agriculture Committee Room. And, of course, Jack’s not taking counsel. Which wouldn’t ever happen in Washington. 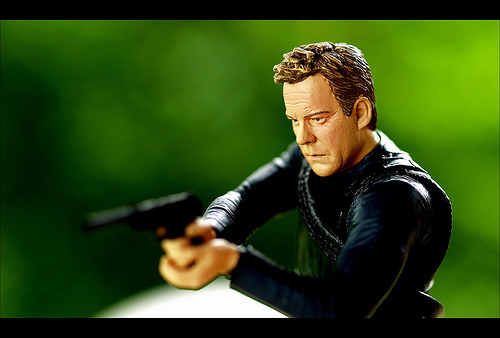 But, this is Jack Bauer. If you kill him, it just makes him angry, can you imagine what forcing testimony would do? Phew. Where are the well photographers? Michael Latham is the guy we saw before, talking on his cellphone in traffic in DC. Turns out he designed something big, important and, dare I say it, technical, for the US Government. The thieves want to crack a “CIT Firewall” using all the stuff they’ve stolen this week. Now they’re on the Delta Shuttle, er, I mean, Global Skies, taking off at a field that looks nothing like Washington National. The traffic pattern near the end of the airport field doesn’t seem to match. Oh great, we’ve put all the critical infrastructure behind one firewall? These people clearly haven’t ever met anyone from government procurement. Why buy one firewall, when you can get ten at ten times the price? That’s so not National. National has water at the end of runway, guys. Fortunately, the CIP Modules were out phase and the plane didn’t blow up, like they expected. Tony’s deeply displeased with his lack of success and heads back to beat Michael Latham’s skull in. And, thankfully, we’re in to the first C-break. All underground time. We’re in the Sit-Room at the White House, the Washington Bureau of the FBI (conveniently located in Judiciary Square) and in a faceless basement somewhere in DC. Not too much going on that we can comment on. Other than it’s absolutely silly to think that all the national power grids, and other utilities actually operate on their own private network. Nope. Not at all. We’re pretty susceptible to attacks of that kind. Hey, look, that’s actually DC! Lafayette park, perhaps? Well, no. Looks like the Grant Memorial, give or take. Which seems to be an odd place to go for a walk. “1208 Naylor Road” is listed as the address of Schacter, the supplier. “That’s downtown!” the guy responds. Sigh. That’s not downtown. That’s, like, down near Suitland. C’mon guys. You’re not even trying. And it’s another C-break. DC 1, Jack Bauer 3. I’m amazed, that Jack hasn’t killed anyone yet. I had 30 minutes in the pool, and several other people here have spots up to an hour. And now we’re out in DC again. Well, supposedly DC. Seeing a lot of bigger buildings out Jack’s window, which has me thinking we’re not in DC. Again. This is not rocket-surgery people. Fifteenth and H Streets. Not Naylor Road. Why not just say he’s at 15th and H in the Washington Hotel building? I mean, c’mon. Good shot of Treasury, though. Score one for Jack. How does a guy named Schacter have an Irish accent? Strange parentage, I guess. And the partner folds on torture. Excellent. Shooter on top of “The Columbia Building.” Right. How come the cops didn’t hear the shots fired? Glass breaking has a pretty big sound profile, even downtown in the middle of the day. The shotspotters all throughout DC probably would’ve picked those up, especially that close to Treasury. There’s no alley on H Street there. Okay, I have No earthly idea where we are right now. But that’s nowhere near 15th & H Street. Besides, how do you get a shooter on a rooftop that close to the White House? No freaking way. Graffiti downtown? Multi-story fire-escapes? Have these people ever been into the Downtown Core of DC? I’m marking this two more points for Jack Bauer. 5-1 is the current count. Some confusion about what’s going on with the Air Force. We’re thinking they’d launch from Andrews, and they’d be there a helluva lot quicker than 13 minutes. We’re now over at the Harbor somewhere. Waterfront, at least. And that’s where our terrorist friends are. “It’s the basement at Cantina Marina!” shouts Dave. Where’s the Press Corps? Five people? Wouldn’t the President announce this kind of thing herself during Primetime? And c’mon, they at least get chairs in the Press Room. Just plain Silly. I’m also told, by someone who was there yesterday, there’s no Plasma TV in the Oval Office. There’s some conversation now about Plasma screens being more versatile for displaying portraits. Oh you’re not from here, are you lady? “Lot behind the building”? Really? In the middle of downtown? C’mon, for real, guys. Back on the streets of DC again. South Capitol Street, heading away from the Capitol, it seems. Perhaps they’re actually going to Naylor Road? …and we’re back in LA again? There’s some discussion as to whether or not we’re down by the Mandarin Oriental. I’m not convinced that the sightlines are right, and the buildings in the background over the woman’s shoulders look way too tall. Now we’re back to the boat. They’re near the Navy Yards we’re guessing? The large white buildings look a little too big for the small commercial area in that space. It also looks like the opposite shore across from the area is way too developed to be the Anacostia. We’re thinking now they’re down by the Robinson Terminal, or some of the other shipping spots on the Potomac south of Alexandria. Or maybe the harbor in Baltimore? Cranes in the background there. And that’s it. Night one, we’ll call it Jack Bauer 6, Actual DC 1. Some real bush league mistakes, here, what with the crash scene in the middle of LA to start the show, and the scene overlooking some surburban California wasteland. Ah well. Better than most folks do, it seems. Very entertaining Tom. I’m sorry I didn’t find this until the last 5 minutes to tonight’s show. I’ll tune in for tomorrow’s episode. Thanks Marc! We may start a little late tomorrow, as the traditional Monday night meeting of the WLDC authors gang is at 6 tomorrow. Also, I love how between 8 and 9 AM on what is apparently a weekday (since Congress surely doesn’t hold hearings on weekends), there is NO TRAFFIC in downtown DC, and not only are our protagonists able to park on the street, but they can walk blithely across said street, in the middle of the block, without checking for cars, but instead staring up at the buildings around them. This was an awesome post. I was thinking several of these things during the episode in the back of my mind (such as the tall buildings and no water at DCA), but very amusing to see this all listed together! Love it! Actually, I’d say score 2 for DC. The quick TV clip of Brian Bolter from Fox5DC was actually a nice detailed touch that only us locals would appreciate. 8:48am – Actually, they were Downtown in this first hour; they were at the Willard at 14th and F Streets. I know because I work accross the street. And who runs a 767 between DCA and JFK?! What is this 1977? You’d be lucky if it was a regional jet. This is a great post; I had almost the exact same reactions as you did at the exact same points! @Dawn you’re spot on. I missed that. We’ll call Hours 1 & 2 a total of 6-2. @Brian Yeah, a 767 between DCA and JFK? not bloody likely. @Brian, Yes, they were downtown when they were going to go question the guy at his office, but in the very first few minutes, when the little girl and her dad were in the car accident… THAT was shot in LA. Because there were skyscrapers in the shot, and there are no skyscrapers in DC. Bravo on the post! The lamest mistake, and most easily avoided was the Naylor Road comment. if they didn’t want to use a real address they could have use 129 Vermont Avenue or something. 8:10am It could have been the US Air shuttle! Amen @Brian – no airlines runs a 767 between DCA and JFK unless someone got drunk the night before. 9:10am NEADS (http://www.neads.ang.af.mil/neadsMission.htm) is in upstate NY. Not sure where all the alert aircraft are, but if the plane was that close to NY, I’d be surprised if they used Andrews. Bravo Zulu, Matt H, on the two points. I had confirmation from another friend in the know that the only flights between DCA and anywhere that use a 767 is the Delta run to Atlanta, and only rarely. Odd that they’d use NEADS for that response call, but either way, the whole thing felt pretty weird. No one really asked the good questions there.